This is a funny version of the classic family card game in which players collect sets of four cards by exchanging cards with other players. This version covers topics of the world of aviation. Collect four stewardesses, planes, food items, stewardess accessories, pilot gear, items you will find in a stewardess’ bag, and more. Lots of fun at ten thousand feet, while waiting at airports or at home. Provides hours of playing pleasure and a humorous insider’s look into the glamorous world of stewardesses. Maybe your flight attendant will want in on the game! 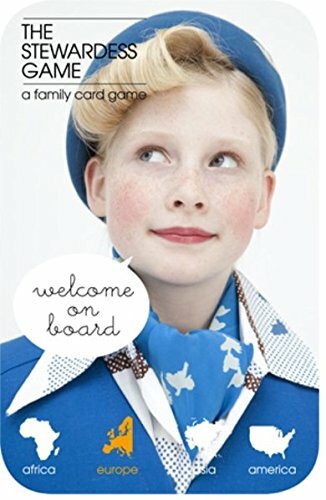 This is a funny version of the classic quartet game in which players collect sets of four cards covering topics of the world of flight. Lots of fun at 10,000 feet or while waiting at airports. Provides hours of playing pleasure and a humorous insider's look into the glamorous world of stewardesses. Welcome on board!